Mangrove Cove is the first level of Donkey Kong Country: Tropical Freeze, located in the Lost Mangroves area. In Time Attack mode, a time of 1:50.00 is required to get a gold medal, a time of 2:10.00 for silver, and a time of 2:30.00 for bronze. The level begins after Donkey Kong forces himself out of a destroyed plane, which he has been thrown in to the island by the Snowmads. Back in the plane, the player can find an Red Balloon, as well as some TV's which display the logo of Donkey Kong Country Returns if pounded next to, exactly like in said game. 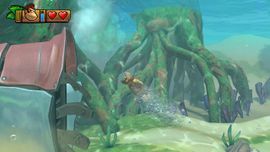 Donkey Kong will first go down a running waterslide which leads him into a lake, introducing the ability to swim in the game. If he collects some of the bubbles coming from a diving helmet-like pipe, DK can refill his meter, which is a limit on the amount of time he can be underwater. After getting out of the lake, which contains Finleys, Donkey Kong will go through a beach area with Dozies, and Punchy Paddies. At a rock platform, a Tutorial Pig will tell the player how to pound, and if they do it where the Punchy Paddy was, it will reveal an underground area with several bananas. After that, there is a wooded-like area with a Venus Trap Platform, and more Dozies. Here, the Tutorial Pig will tell the player that they can flip down platforms tied by vines with ZL and ZR. After that, a large flying banana appears, giving the player a Puzzle Piece, followed by a checkpoint. The player must then use the pulling technique on a tree stump to open up a large platform area containing more Venus Trap Platforms and Punchy Paddies. After collecting the fourth Puzzle Piece, the player will find a Barrel, which will bring Diddy Kong into the game and enable the multiplayer function. With Diddy Kong, his jetpack enables the duo to fly, which helps them cross a pit of thorny vines. Following that, the player can exit the area, falling into another water body like the first one, with Wild Wendells. Here, DK and Diddy can find an Extra Life Balloon on a platform above the surface, as well as Banana Coins and a letter. After swimming through the grass underwater, the Kongs will find get a chance to collect three Life Balloons in an amount of time. When they get past the beach area after the lake, there is a stump plug, similar to the one before, that the player must pull to reveal another pop-up jungle area, with Barrel Cannons leading them to another Puzzle Piece. Following more cannons, which at one point will contain a letter, DK and Diddy bounce through trees into a small beach area with another checkpoint. After going through the beach, which contains a falling Snowmad ship, Venus Trap Platforms, Fluffs, Waldoughs, and Tucks, as well as the "G" letter, the Kongs can blast to another island via a Barrel Cannon and end the level by hitting a Slot Machine. K: Between two of the treetops on the beach after the first lake. O: Under the tree above the second lake. N: In the second jungle area, located in the air and must be obtained by going through a Barrel Cannon. G: After throwing the Tuff Tucks from the swinging platform onto the pole, it will turn and reveal another platform where the letter is. DK and Diddy, rushing to collect all the Banana Bunches thrown by Professor Chops doppelgangers. Behind the red-blue metal chunk, found soon after jumping into the water. After opening the two platforms, the player must grab the flying banana which will turn into a puzzle piece. In an area revealed by pounding right under the first Venus Trap Platform in the metal-like area. After getting Diddy Kong, the player can go back and jump on top of the previously mentioned Venus Trap Platform and get the piece which is on a platform above it. Spinning in the air, the player must time their shot from a Barrel Cannon correctly to get it. Upon pounding on the crate after the second platform in the beach area with the pirate ship, there will be a secret underground area where some Tutorial Pigs will toss the the Kongs multiple bananas. If they collect all of them, a Puzzle Piece appears afterwards. Shooting through the barrel above the swinging platforms will reveal a secret area containing a large amount of bananas to collect in 30 seconds, after which the Kongs will get the Puzzle Piece. The final Puzzle Piece is obtained by going to past the end barrel and pulling the plug which will reveal it. This page was last edited on April 15, 2019, at 12:21.